Emil Dahlstram, a Finnish former sailor, became a hero in the battle for the town [of Péronne] although he had not always been an exemplary soldier. 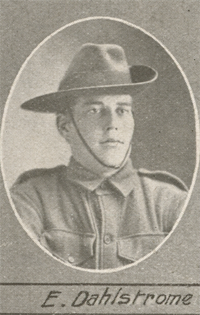 Enlisting at 20 years of age, he served through Gallipoli and most of the Western Front battles, running up a number of offences along the way -- being absent without leave several times and disobeying orders. In this advance he acted 'as a section runner', his duty being to maintain communication between the advancing troops and Infantry Battalion Headquarters at the rear, which meant frequently having to pass through very heavy artillery and machine-gun (M.G.) fire. At one stage some wounded men were left stranded in front of the line, owing to a temporary withdrawal east of Mont St Quentin, where the men were. 'On learning this, and not being able to obtain stretcher bearers, Pte. Darlstrom [sic] went forward into no man's land and carried in a wounded man; this action he repeated no less than six times, thus bringing seven wounded men to cover under heavy M.G. and rifle fire.' Dahlstram was awarded the Military Medal.